any time interval, accurately measure performance, and gain insights to improve your business. Managers and supervisors can stay involved in their call center’s day-to-day operations anytime, anywhere. 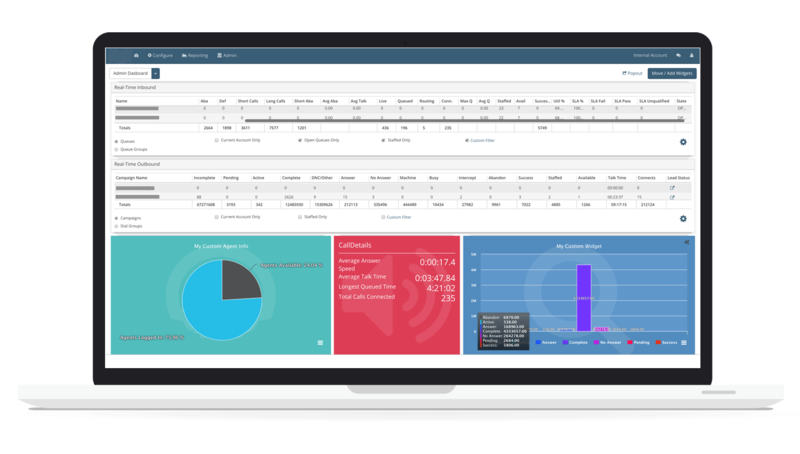 Access reports and dashboards from any mobile device or tablet, enabling you and your staff to monitor SLAs and KPIs while walking the call center floor or on the road. Keep close track of manager, supervisor, and agent KPIs with our highly customizable real-time dashboards. Instantly access important KPIs like service level, agent adherence, and sales closed, and use that information to intelligently adjust your processes and strategies on the fly. Both our historical reporting and real-time dashboard functionalities are intuitive, easy to use, and full of helpful, time-saving features. Drag and drop the elements you need to create dynamic, information-rich custom dashboards, or leverage our out-of-the-box reports to get your data faster.